It’s been a couple of years since we first conceived the idea of a mobile electronic medical record (EMR) for remote, low resource settings in low and middle income countries. Since then, we built the QuickChart EMR Android app from scratch. It has been downloaded over 1700 times on Google Play. And it has been beta tested by dozens of medical students, residents, and practicing physicians worldwide. In fact, you can even download it right this second. The rapid-fire summary. It’s a simple, secure, mobile EMR designed for the unique challenges of volunteers working in remote settings (especially Latin America). Equally important, it’s an offline tool that provides context-appropriate clinical guidelines to those same volunteers. 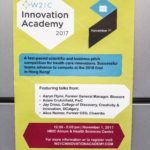 Last week, I travelled to Calgary to pitch in the W21C Innovation Academy. W21C Calgary is one branch of an international partnership between Hong Kong Polytechnic University, the University of Geneva, and St. Michael’s Hospital in Toronto. Incredibly, we won the social innovation award. We’re incredibly grateful. There’s money attached to the award, of course, but more important is the vote of confidence that the award represents. It’s meaningful that our passion for the QuickChart project is reflected in the excitement of others. The next stop is the Global Healthcare Innovation Academy in Hong Kong in August, where we pitch again, this time in front of an even larger audience. Then, I had to stand next to a poster, and answer the judges questions. Finally, it was pitch time. I learned that not only do I have to learn how to use a hand mic (hint: you cannot flail your hands around wildly as you are holding it), but that it’s much easier to pitch in front of a mirror than it is with an auditorium full of people. And with a 3 minute timer counting down in the background. Business plan and sustainability: “I have no idea if it’s sustainable,” said one of the judges. Yup. 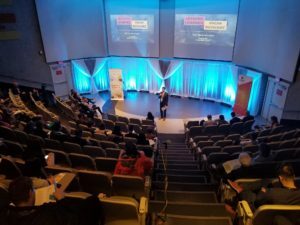 Pitch practice, and plenty of it: “You need to have a 30 second pitch, a 2 minute pitch, a 10 minute pitch, a 20 minute pitch,” said another judge. And maybe a pitch in Spanish and French for that matter.